In many churches, candles are blessed on this Feast. Do you realize that, if you were baptized as a child, then you were also "presented" to the Lord! And if you were baptized as an adult, then you presented yourself to the Lord. At our baptism, since we receive the light of Christ, we are presented with a candle, lit from the Easter candle which symbolizes Christ the light of the world. We are also anointed with Sacred Chrism, and are made temples of the Holy Spirit. We actually become "Christs" ("anointed ones") and become members of Our Lords body. Do you believe this? Or do you think that you are too ordinary to be so special? Well, the Christmas which we celebrated not long ago tells us that God shared in our ordinary life, too! He shared our humanity to let us know that each and every one of us is extra-ordinary. You, too! I was baptized by my uncle, Fr. 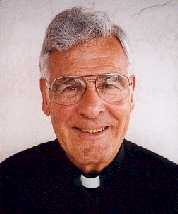 Norbert Mersinger, a priest for the Archdiocese of St. Louis, MO. I think Fr. Norb baptized five of the six kids in my family. At each baptism, my dad stood very close to Fr. Norb as he called us by name, "Patrick Gerard, I baptize you in the name of the Father, . . ." Apparently, during pre-baptism discussions Fr. Norb always insinuated that he might add his own name to the names given to us by our parents. My official Christian name might have been "Patrick Norbert Gerard," or my sister could have ended up, "Mary Norberta." Our names become a living symbol of our very selves. When we are called by our names at our baptisms, it reminds us that God knows and loves each of us personally. When we are confirmed, we are called by our name. Its not only the bishop, priest, or deacon who calls us by name, but Jesus Christ himself. For a world of frail promises and ready violence...May all people return to God with their whole heart...Together may we bring about a just and lasting peace. We pray for the ill: Sharon Aiello, Marilyn Arancibia, Ilaria Belluomini, Bastiaan Blumenthal, Guido Botelho, Marcia Bourne, Ann Burns, Joseph Calleja, Arthur Candia, Josie Clarke, Nan Connolly, Ana Cosgaya, Imelda Daly, Walton & June Dickhoff, Sandra & William Dill, Ray Driscoll, Carl Edwards, Adela Florez, Elsie Grech, Denise Hawald, Joanne Johnson, Koret Koelman, Muriel Krause, Josephine Lavoie, Marky, Daniel McHale, Rosemary McHale, Jeanne McHugh, Terry McLeod, Sal Milizio, Bunny Moniz, Catherine Okulove, Leo Pieretti, Richard Quintana, Pauline Speranza, Kari Stellino, Don Vickery, George Jones, Henry Fosson, & Bernie Voight. The Church Environment Committee is giving away the silk ficus trees which have decorated our church for many years. Call Pat Vallez-Kelly at 589-2800 if interested. We are scheduled for the 2nd Wednesday of each month. If you can prepare a favorite cookie, snack or lunch items for 10 to 12 people, please drop it off at the Childrens Chapel, in the back of Church, by 9:00 am on Feb. 13th. Please pack the items in a non-returnable container. Frozen items can be donated. We appreciate all your help. Calling all teen actors, singers and musicians of the parish! The Passion Play needs you! We will hold a general meeting on Monday evening, Feb. 4th, in the Church, starting at 7:30 and ending at 8:45 p.m. The Passion Play is an annual celebration performed by the teen youth of St. Roberts parish on Good Friday Night. Any questions? Call: Ben Baldonado or Bob Baker. The Maltese Cross Foundation is proud to announce its seventh annual Vella-Dankwerth Cultural Scholarship for students of Maltese descent in the San Francisco Bay Area. High school seniors, college freshmen, sophomores, and juniors are eligible to apply. Completed applications are due by March 18, 2002. For more information, please contact Janel Dankwerth-Plack (707-591-8878) or Jennifer Dankwerth (650-273-1356). A spectacular and dramatic presentation of scripture, light, and movement when Michael Reardon and Patrick Lane bring THE GOSPEL OF MATTHEW to our community. This is a profoundly moving and totally captivating work of faith, making the Scripture come alive in a fresh way. A great way to begin Lent!! Michael and Patrick have traveled around the world with this powerful ministry of proclamation. It is precisely peace born of justice and forgiveness that is under assault today by international terrorism. In recent years, especially since the end of the Cold War, terrorism has developed into a sophisticated network of political, economic and technical collusion which goes beyond national borders to embrace the whole world. Well-organized terrorist groups can count on huge financial resources and develop wide-ranging strategies, striking innocent people who have nothing to do with the aims pursued by the terrorists. When terrorist organizations use their own followers as weapons to be launched against defenseless and unsuspecting people, they show clearly the death wish that feeds them. Terrorism springs from hatred, and it generates isolation, mistrust and closure. Violence is added to violence in a tragic sequence that exasperates successive generations, each one inheriting the hatred which divided those that went before. Terrorism is built on contempt for human life. For this reason, not only does it commit intolerable crimes, but because it resorts to terror as a political and military means it is itself a true crime against humanity. There exists therefore a right to defend human reasoning; and this, in the first place, on the basis of what people experience when they do wrong. They experience their human weakness, and they want others to deal leniently with them. Why not therefore do toward others what we want them to do toward us? All human beings cherish the hope of being able to start all over again and not remain forever shut up in their own mistakes and guilt. They all want to raise their eyes to the future and to discover new possibilities of trust and commitment. Forgiveness therefore, as a fully human act, is above all a personal initiative. But individuals are essentially social beings, situated within a pattern of relationships through which they express themselves in ways both good and bad. Consequently, society too is absolutely in need of forgiveness. Families, groups, societies, states and the international community itself need forgiveness in order to renew ties that have been sundered, go beyond sterile situations of mutual condemnation and overcome the temptation to discriminate against others without appeal. The ability to forgive lies at the very basis of the idea of a future society marked by justice and solidarity. By contrast, the failure to forgive, especially when it serves to prolong conflict, is extremely costly in terms of human development. Resources are used for weapons rather than for development, peace and justice. What sufferings are inflicted on humanity because of the failure to reconcile! What delays in progress because of the failure to forgive! Peace is essential for development, but true peace is made possible only through forgiveness. Forgiveness is not a proposal that can be immediately understood or easily accepted; in many ways it is a paradoxical message. Forgiveness in fact always involves an apparent short term loss for a real long-term gain. Violence is the exact opposite; opting as it does for an apparent short-term gain, it involves a real and permanent loss. Forgiveness may seem like weakness, but it demands great spiritual strength and moral courage, both in granting it and in accepting it. It may seem in some way to diminish us, but in fact it leads us to a fuller and richer humanity, more radiant with the splendor of the Creator. My ministry at the service of the Gospel obliges me, and at the same time gives me the strength, to insist upon the necessity of forgiveness. I do so again today in the hope of stirring serious and mature thinking on this theme, with a view to a far-reaching resurgence of the human spirit in individual hearts and in relations between the peoples of the world. Reflecting on forgiveness, our minds turn naturally to certain situations of conflict which endlessly feed deep and divisive hatreds and a seemingly unstoppable sequence of personal and collective tragedies. I refer especially to what is happening in the Holy Land, that blessed place of Gods encounter with man, where Jesus, the Prince of Peace, lived, died and rose from the dead. The present troubled international situation prompts a more intense call to resolve the Arab-Israeli conflict, which has now been going on for more than 50 years, which alternate phases of greater or lesser tension. The continuous recourse to acts of terror and war which aggravate the situation and diminish hope on all sides must finally give way to a negotiated solution. The rights and demands of each party can be taken into proper account and balanced in an equitable way, if and when there is a will to let justice and renconciliation prevail. Once more I urge the beloved peoples of the Holy Land to work for a new era of mutual respect and constructive accord.